A kinda fabulous thing about The Economist is that they'd actually go and track something as ridiculous as shark attacks all the way back to 1580. 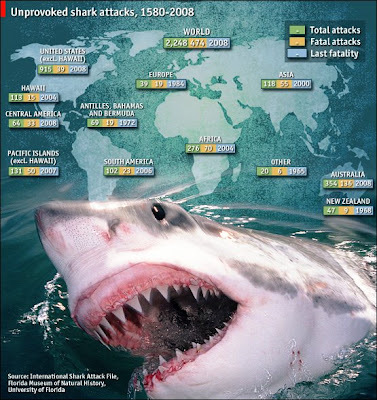 My only concern is: what do they mean by unprovoked shark attacks? Are there many provoked shark attacks? Is someone going around and poking sharks? Their graphic designer gets a big win too.